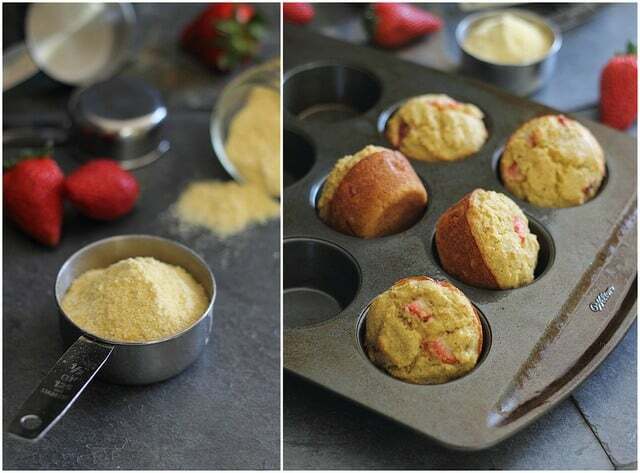 These strawberry corn muffins have a nice hearty texture from the corn meal and almond flour and are slightly sweet from the strawberries. I was really happy yesterday. Two days in a row of 70+ degree weather, extended time in the sun, outdoor CrossFit workouts, walks with Ginger in a tank top & flip flops…life was good. In fact I was driving home from CrossFit last night thinking about what I’d write in this post and positivity was just oozing out of me. Then I got home, got on the computer for a split second before making dinner only to see a message about a plugin I use on this site for the social media icons (that used to be on the top right of the screen) and how it was infecting users (meaning my site not you guys, don’t worry) with malware and the positivity went right out the window. Can we just talk about internet hackers for a sec? I cannot even imagine how ridiculously lame someone’s life has to be to spend their time plotting ways to hack into things online. Is there some hacker award I’m unaware of out there? A Golden Globes for the cyber nerds or something? Like, WHAT IS THE POINT? Tell me. Please. Because I just don’t get it. And do you get paid to do this? How does one make a living being a hacker? Or don’t you and that’s why you’re most likely operating out of your mom’s basement. Here’s my mental image of you, internet hackers. You’re a fat kid in your mom’s dark, windowless basement shoving your face with Pringles. You look like Zach Galifianakis, but uglier (if that’s possible) and you’ve never met any of your “friends” because they’re all from online hacker forums that you probably spend 23 hours of your day in. And, apparently you get your kicks from making random people miserable by “infecting” their computers and websites just to say “you did it”. Thankfully, the incident was short lived. A quick deleting of the plugin took care of it and google never blacklisted me or anything. Dear hackers, you lose. So back to that positivity…. 3 lbs. of strawberries for $3 makes me happy. So do these strawberry corn muffins. They’re paleo meets corn meal and I just love them. The texture is fun, the strawberries are sweet and I’m betting those hacker slobs wish they had these instead of that can of Pringles. Combine corn meal, almond meal, baking powder and salt in a large bowl. Whisk together remaining ingredients except strawberries in a separate bowl. Add wet ingredients to dry and mix to combine. Spoon mixture out into muffin tins. Remove from oven and let cool for 5-10 minutes before popping out of the tin. Isn’t the weather lately just a dream? I wore flip flops last night and was in heaven. Ugh. Hackers are of the lame. Sorry you had to go through that dramalama. There is such a thing as “Safe” hacking in promoting network security like at a large-scale level or federal level (to protect ‘Merica), but I’ll stop being a nerd. The ones who mess with blogs are just sad. What isn’t sad, though, are these muffins. Stop making such delicious-looking snacking items. But really, don’t. Because then I’d be sad. And that would also be of the lame. I HAVE to make these this weekend. And um, where do you get 3 pounds of strawberries for $3..?!?! Glad you got everything back up and running! I can’t stand when issues happen like that of course I’m totally jealous of your weather because it never got that warm here! Soon enough hopefully… okay, likely in another month here :o sigh. but i’ll have a muffin or two while I wait. probably about the same point as someone pulling a practical joke and laughing at the misfortune. side note – are you bringing these to me today? bc they look amazing. Yum! 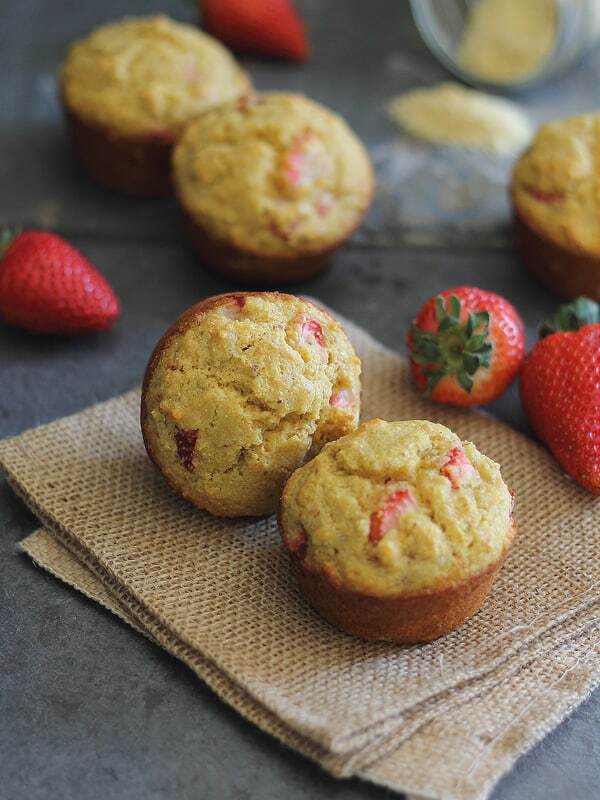 I feel like I’ve made jalapeno corn muffins 100 times now, so strawberries might be a nice change of pace. i really want to try this recipe with the almond and corn meals. sounds great! UGH, I know what you mean! I’ve had this conversation many-a-times with my coworkers (fellow nerds) and I just don’t GET what kind of pleasure these stupid hackers get. I mean, COOL, you know how to hack a site and inject it with malware and all that…but what are you REALLY getting in return? Besides your buddies patting you on the back? It’s just so stupid. these look so amazing and your photos are so gorgeous. I have been so obsessed with strawberries lately. So cheap here too. I cannot get enough. I think I need to try these. Super bummer on the hacker stuff. BTW would you mind sharing what plugin you were having the issue with? I have had some issues in the past where people were getting malware warnings on my site, but I could never track down the source. It was the “social media widget”. Here’s the article about it: http://blog.sucuri.net/2013/04/wordpress-plugin-social-media-widget.html Hope you don’t have to deal with it too! These look positively delish. I haven’t baked muffins in awhile but these are calling my name. Do you suggest them for breakfast? I don’t understand hackers either. I don’t understand how someone can have absolutely no life and decides to spend their time annoying others! On a positive note though, these look so good! 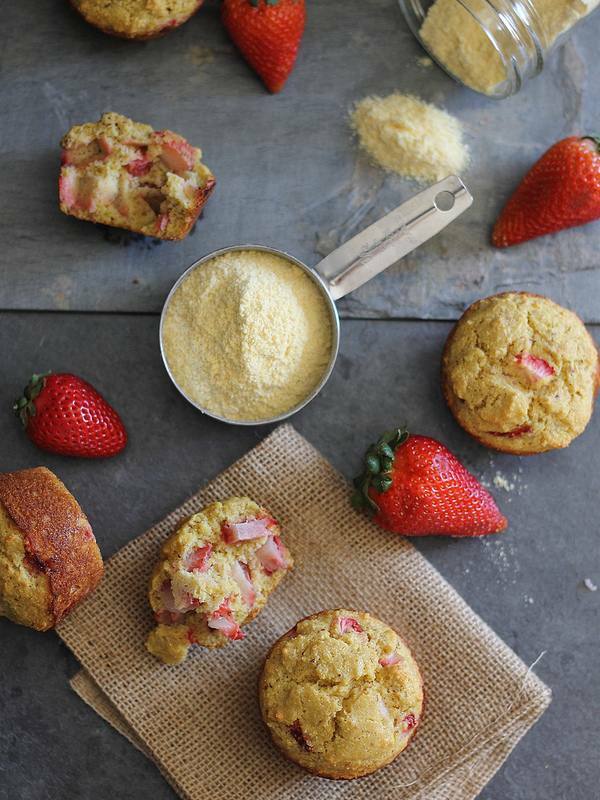 I love the combo of the cornmeal and strawberries! Not the biggest fan of strawberries, but I might give your muffins a good with mixed berries instead. Thanks for sharing! Your description of hackers is hilarious. And these muffins look delicious. Love the cornmeal for texture. Made these last night without strawberries. They were awesome!! I was really pleasantly surprised ’cause not all the alternative baking recipes I try come out so good. Can you use frozen strawberries and can you use almond flour instead of almond meal? yes, to the almond flour. If you use frozen strawbs I woulds make sure they are thawed and drained of excess liquid before combining with the batter so it doesn’t throw the wet to dry ratio off. Should be ok, but I haven’t tried it that way.